NANO (formally RaiBlocks) is one of the most beat-up, consistently sold off, and saddest looking charts I’ve ever seen. It’s horrid actually. I always look to see why. Why is NANO so beaten down? Why is almost every rally sold off? To me, it has all the hallmarks required for noticing institutional selling. And that’s something I like to pick up and buy up. I also want to say that as a Gannyst or Gann based trader, I don’t really care about the fundamentals of a cryptocurrency – so I don’t know much about the team or the history of NANO beyond some basic research. What I do know is charts and volume and what to spot. NANO is like a black dot on a white wall. 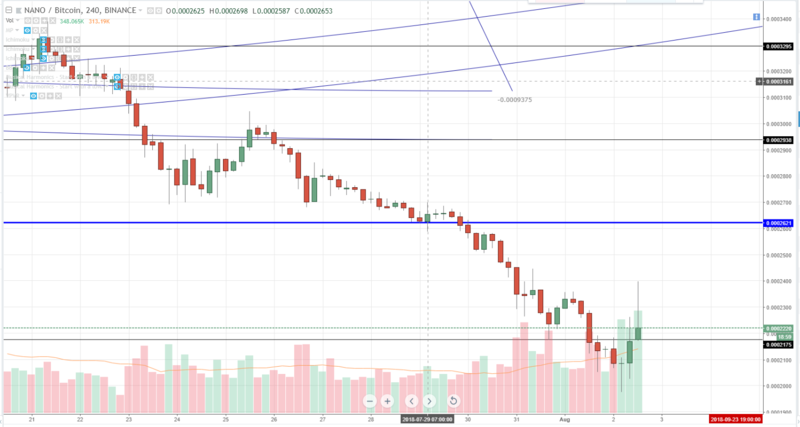 Before we look at the chart, let’s get some of the fundamentals regarding NANO out. It’s fast. It’s stupidly fast. Instant is the word I’d use. And it’s free. I’ve transferred NANO from the wallet to Binance and before I could even tab over to Binance, the transfer was complete in my wallet. That is utility and a valuable one. Additionally, we need to take a look at the technicals on the chart. Volume. Volume is important. Some would argue it is the most important indicator. The great majority of cryptocurrencies that are no in the top 10 are prone to random volume surges in the form of pump and dumps. Along with that: many of those sub-top 10 coins have very low volume and decline as a result of no interest or a normal decline in volume due to the aggregate decline in the broader market value. NANO is different. NANO has a surprising amount of consistent and strong volume on it’s chart all the time. But it’s the kind of volume that I know exists when institutions want to direct an instrument a particular direction. With equities, we see this only with special access to Level II and above. You can see this in the Futures markets as well and in Forex. 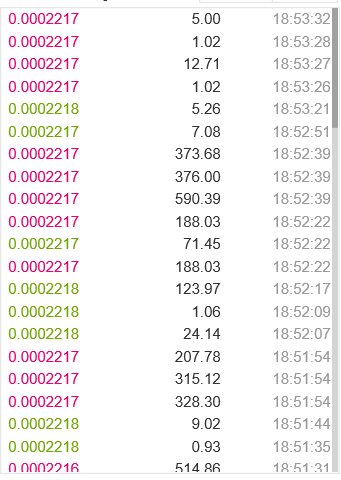 For cryptos, what I saw today kind of made me do a double take and I wish I would have taken a screen shot. This is the trade history window for NANO, it updates the market trades as the happen for the bids and the offers.